This post is a guest contribution by Dian Chu, market analyst, trader and author of the Economic Forecasts and Opinions blog. Risk analysis firm Maplecroft just released its new fiscal risk index ranking of 163 countries. Europe trumps all other regions with 11 out of twelve countries rated as “extreme risk.” However, quite surprisingly, only one PIIGS country–Italy which takes the top spot–is in the top 12. The others include many big economies in Europe – Belgium (2), France (3), Sweden (4), Germany (5), Hungary (6), Denmark (7), Austria (8), United Kingdom (10), Finland (11) and Greece (12). Japan at No. 9 is the only other country not in Europe within the highest risk category (See map below). While high national debt and public spending are two common denominators, the study finds it is the aging demographics that puts these countries at extreme fiscal risk. An aging population will place increasing pressure on public expenditure such as pension and health care, while a shrinking working-age population means less productivity and less tax revenues to support public spending and debt payments. Aging population also means high dependency ratio, or the number of people 65 and older to every 100 people of traditional working ages. For example, according to Maplecroft, the dependency ratio in France is 1 to 47 (i.e. 47%), Germany at 59%, Italy with 62%, and Japan at the very top with 74%, while the ratio in UK is currently 25%, and is forecast to rise to 38% by 2050. Another problem within Europe is that it has a low labor participation rate in the 65+ age bracket. In fact, the labor market participation of age 65+ amongst the ‘extreme risk’ nations range from 1.4% in France, 7.71% in UK, to 11.7% in Sweden, vs. a 28% average across all countries ranked in the index. Maplecroft cited pensions and discrimination as two examples that would push people away from the work force. 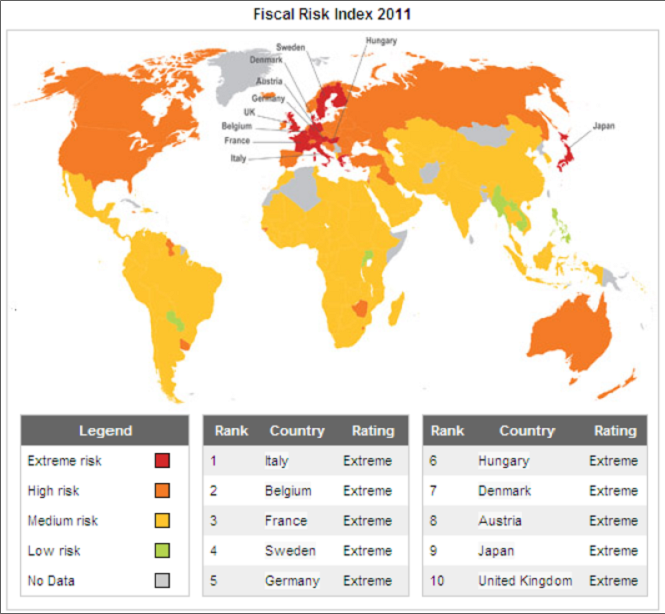 Although the United States is not ranked among the “extreme fiscal risk,” the nation is nevertheless classified as “high risk”, along with Spain, another PIIGS country, Turkey, Iraq, Australia, Canada and Russia. Let’s take a look at the two metrics mentioned here. The dependency ratio in the U.S. is 22 in 2010, but is projected to climb rapidly to 35 in 2030, according to the U.S. Census Bureau, mainly due to baby boomers moving up into the 65+ age bracket. The ratio then will rise more slowly to 37 in 2050. The labor participation for age 65 and over in the U.S. is at 17.5 according to data at Bureau of Labor Statistics (BLS). This is better than most of the European countries, but below the overall average of 28%. Most people typically associate a country’s fiscal risk to its government’s monetary and fiscal policies, and Lehman Brothers has taught us that banking and housing crisis could push the entire world into the Great Recession. While these are all definite risk factors, a highly productive labor force and relatively young population makeup tend to ensure more sustainable prosperity and better odds at climbing out of a hole. So, while Europe is being forced to do all that amid sovereign debt crisis in the middle of widespread protests over raised pension age and austerity measures, the U.S. and other “high fiscal risk” countries seem be set up as the wave 2 of this global fiscal chain of events. Source: Dian Chu, Economic Forecasts and Opinions, February 25 2011. Well, Greece is at #12, and that’s G in PIIGS, so technically two of the PIIGS appear in the top 12. Nevertheless, you make a good point: the PIIGS are not the only pigs out there.